Fresh from Paris fashion week, Olga Kurylenko hit the red carpet for the premiere of 'Johnny English Strikes Again' at the Curzon Mayfair this evening(October 3rd) in London. 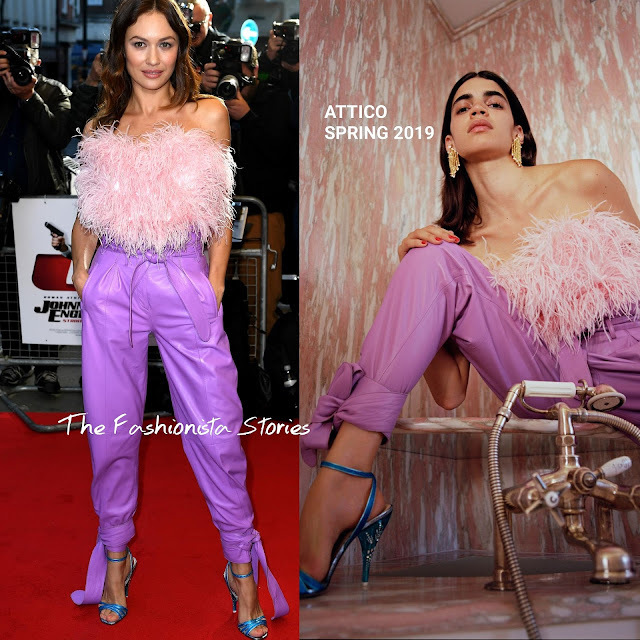 Rocking a playful, edgy look, she wore an ATTICO SPRING 2019 ensemble which featured a pink strapless feather top, lavender leather paper bag pants and the 'Lola' sandals. Instead of wearing the yellow beaded earrings from the look books ensemble, she opted for SUSAN CAPLAN silver e dress earrings. Center part tresses finished up her look.